Tyson is an AKC black and rust full European male Doberman born 6.9.17. Tyson is gentle natured, but also a great watch dog. Playful dog who loves going on walks, jogs, and hikes. He is out of an amazing line with over 100 champions in his mother and father’s 5 generation pedigrees. Within his pedigree are Del Nasi, Chagall, Kimbertal, Sant Kreal, Altobello, Pride of Russia, De Britton, Lipar Land, and others. He is 80 lb and 27 1/2” at the shoulder at about 1 1/2 years old. He has been tested for 165 different health issues/diseases and is clear on all! 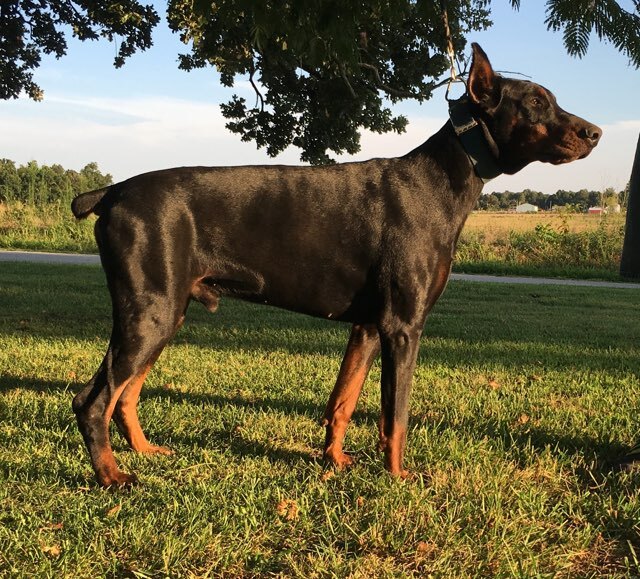 This includes the common diseases to Dobermans: Dilated Cardiomyopathy (PDK4), Degenerative Myelopathy (SOD1A), and Von Willebrand Disease Type I (VWF). It is a rare thing to find a Doberman clear of these diseases, plus all of the 162 other diseases. Those diseases include the following: blood, hormonal, immune, eyes, kidney, bladder, brain, spinal cord, heart, muscular, metabolic, gastrointestinal, neuromuscular, skeletal, skin, and connective tissues. Stud fee is $1500 natural with current negative brucellosis test or $2000 for artificial insemination with additional fee for shipping if applicable. Pictured above is Tyson's mother. Pictured above is Tyson's father.